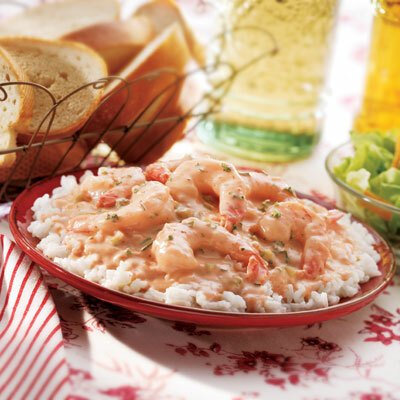 Southern-Style Creamy Shrimp Over Rice is easy to prepare and great for family gatherings or potlucks. MELT butter in medium saucepan over medium heat. Add celery, green pepper, onion, and garlic; cook, stirring occasionally, for 5 minutes or until vegetables are tender. Stir in flour. Gradually stir in evaporated milk, water and tomato paste. Cook, stirring constantly, until mixture just comes to a boil. Cook an additional 1 to 2 minutes or until mixture slightly thickens. Stir in shrimp, parsley, seasoning, salt and hot pepper sauce. Cook until heated through. NOTE:If a spicier dish is desired, substitute Creole seasoning for the OLD BAY Seasoning.